The first prototype of a Morgan Runabout in 1909 was powered by a 7hp twin-cylinder Peugeot engine. The two models on display at the Olympia Motor Cycle Show in November 1910 were already fitted with J.A.P. engines. 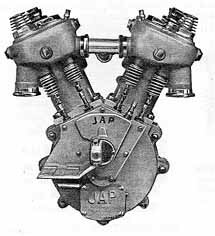 One model was driven by a single-cylinder J.A.P. 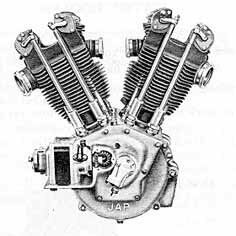 (4hp) and the other one by a V-twin J.A.P. 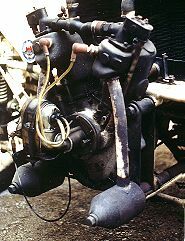 (8hp) engine. 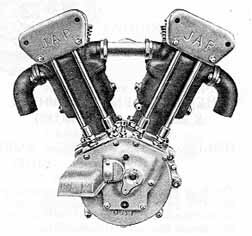 In the next 30 years Morgan relied on V-twin engines from J.A.P. (J.A.Prestwich), M.A.G. (Motosacoche, Acacias, Geneva), Blumfield, Green Precision (F.E. Baker, Ltd., Birmingham), Blackburne, British Anzani and finally Matchless. With the appearance of the "F"-Type in 1933 Morgan introduced a four-cylinder engine to their three-wheelers: The Ford model "Y" E93A. J.A.P. 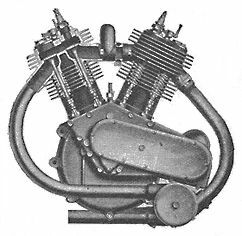 (J.A.Prestwich and Co. Ltd.) V-twin engines were used by the Morgan Company from 1909 onwards in form of the KT-series (Capacity: 980cc, bore x stroke: 85.7mm x 85mm), JT-series (996cc, 80mm x 99mm) and LT-series (1096cc, 85.7mm x 95mm) and either Air-cooled or Water-cooled, SV or OHV and in different stages of tuning. Bore x Stroke: 85.7mm x 85mm. Here follows a brief explanation of the J.A.P. letter coding: T=Twin, O=OHV, W=Water-cooled, C=Sports, R=Racing, Z=dry sump lubrication. 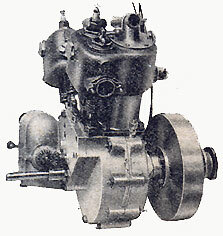 For example KTW means a K-series/Twin/Water-cooled engine. Bore x Stroke: 80mm x 99mm. In 1932 the J.A.P. Company changed the cylinder-angle of their V-twin engines from 50deg to 60deg to achieve smoother running and less vibration. Bore x Stroke: 85.7mm x 95mm. M.A.G. 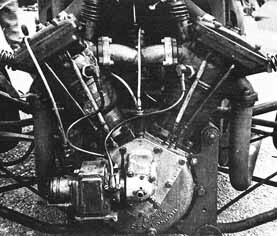 engines have been used in the form of the 2C9A (Air-cooled, 993cc, 82mm x 94mm), 2C13A (Air-cooled, 1094cc, 82mm x 104mm) and 2C20A (Water-cooled, 1094cc, 82mm x 104mm). 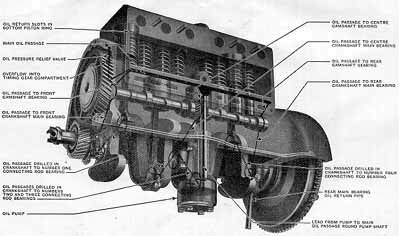 All are IOE engines with a cylinder-angle of 45deg. Bore x Stroke: 82mm x104mm. 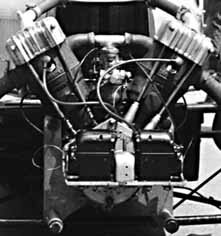 From Blackburne (Burney Blackburne Ltd.) the engines of the type KMA, KMB (racing engine) and KMC (sports engine) have been used with good success. 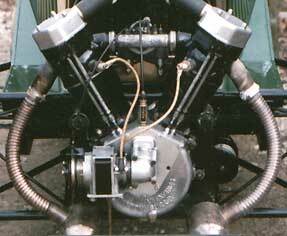 Many records have been gained with the Blackburne engines between 1923 and 1930 by Norris, Beart and Jackson. Bore x Stroke: 85mm x 96.8mm. Bore x Stroke: 85mm x 96mm. Bore x Stroke: 85mm x 95mm. The photo shows an Anzani Racing Special, which is currently owned by Colin Wilson. Sorry, but I do not have any further technical information for that engine. The pictures are from advertisements of the Blumfield Ltd. Birmingham which were published in "The Cyclecar" magazine in August/September 1913. 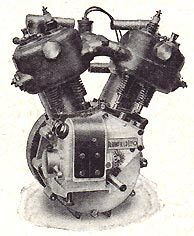 The Matchless engines finally evolved from 1933 onwards. 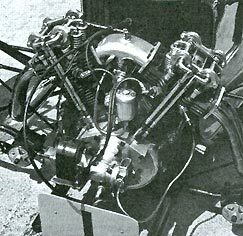 The MX was a SV, Water-cooled, 50deg V-twin with 27.5hp at 4000rpm. It was followed by the MX2, an OHV, Air-cooled engine with 39hp at 4600rpm. 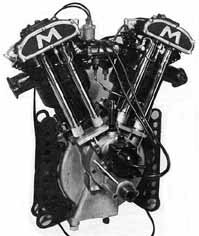 The MX4 was the Water-cooled version of the MX2 and claimed 42hp at 4800rpm. Bore x Stroke: 85.5mm x 85.5mm. The Ford E93A is an in-line 4-cylinder SV engine of 933cc (56.6mm x 92.5mm, 22hp at 3500rpm) or 1172cc (63.5mm x 92.5mm) and was used by Morgan only in the "F"-type models from 1933 until 1952, when the production of the three-wheelers came to an end. Bore x Stroke: 63.5mm x 92.5mm. Max Torque: 36.4lb/ft at 2300rpm.